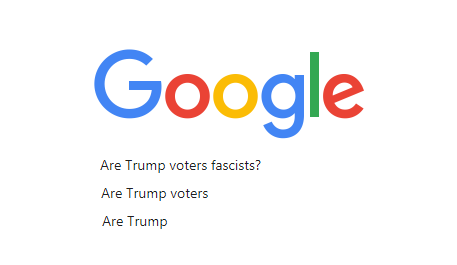 Google, the search engine responsible for 90% of the world’s search results may have some explaining to do as to its alleged left-leaning bias now that a leaked internal video showing the Silicon Valley giant holding a personnel meeting just after the election of US President Donald Trump is comparing the Republican voters to ‘fascists’. Mr. Sergey Brin, the man who co-founded Google together with Mr. Larry Page tries to calm down his stressed-out Google employees who fear for their future after the Trump election. At one point during the conference, Mr. Brin (a Russian immigrant) talks about the typical mentality of Trump voters and how they probably voted for him not because they wanted change, but because they were bored. According to Mr. Bring, people with 'routine jobs' were more likely to vote for Trump than those with 'non-routine' jobs, claiming that 'boredom' might explain the President's popularity. A few weeks ago, US President Donald Trump accused the search giant of burying conservative news deep into its result pages. After those claims, Trump’s 2020 campaign manager Mr. Brad Parscale had called for 'Congressional hearings' and an 'investigation' into the alleged political bias within the search giant. However, Google refused to send an executive to the recent congressional hearings that did feature Facebook’s CFO Ms. Sheryl Sandberg and Twitter CEO Mr. Jack Dorsey. yet it was facists and nazi's that wanted to end free speech just like democrats, while true conservatives want free speech and the rule of our constitutional laws. I was raised in a solidly blue collar environment in the 50's/60's in Minnesota, one of the most liberal states in the union, but I always was taught and believed in the right of free speech. What is going on now by leftists is a PLOT AGAINST AMERICAN SOVEREIGNTY. I remember when liberals were pro-free speech, anti-censorship and anti-war. Yup, times have certainly changed. Sergey Brin, sounds Russian to me. Now what did the Democrats tell us about trusting Russia?